Fully Adjustable: Built in two regulating slots to make the armband adjustable and suitable for most people. Option A: 12.0-14.0″ [30.4-35.5 cm] or Option B: 8.0-11.5″ [20.3-29.2 cm]. And what’s more, a 23.5cm long extension strap is provided for any giant bicep! Easy Access: Allows easy access to all buttons, ports and functions, Our armband offers full screen coverage yet you will retain full touch screen functionality. It is very easy to connect your headphones during your workout, via the available ports located on the reverse of the armband. Key Holder: Built-in hidden key pouch to help you minimize carrying extra things when hitting the gym!You can put a Key,cash…etc. Cutouts for easy access to headphones port and controls. Reflective Strips: With the silver reflective strip encircling your protective screen, when you have the night running along the road, Mpow armband provide better visibility and enhance ‘Jog Safe’ precaution. Made of lightweight, breathable neoprene and Lycra (A type of supurior synthetic elastic fabric) material makes Mpow soft and durable to provide comfort and protection that wicks, breathes, dries quickly and is easily wiped clean. The plastic cover fits close enough to the phone so as not to hinder touch screen use. The armband pouch and cover keeps your phone safe from impact and moisture while working out. 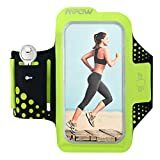 This armband is made of the lightweight, highest quality PVC and its Velcro is made of special Lycra material that fits snug against your arm for a comfortable fit. Outermost layer prevents sweat and moisture and protect your cellphone completely, BUT do not put in water and using in heavy rain. Secure built-in hidden key holder, perfect for house/car keys! Never worry about having to carry your keys in your pocket or losing them at the gym or running. This Arm band is small enough to fit smaller arms, but you can also adjust the comfortable soft stretchable Velcro strap, which allows up to about 12.13″ BICEPS. And what’s more ,the armband now provide a 23.5cm long extension strap, which is definitely suit any giant bicep. It compatible with iPhone 6, iPhone 6s, Samsung galaxy s6. Great choice for sports, running, climbing, tracing the creek, fishing and tourism and so on.